Coach Pearl receives a well-earned contract extension. After leading the Vols to three SEC East championships in the past four years, it was announced today by the University of Tennessee that basketball head coach Bruce Pearl would be receiving a one year extension on his contract that also laid out an increased compensation package. I am grateful to President Simek, the Board of Trustees, Athletic Director Mike Hamilton, my staff and of course our players. I appreciate the Tennessee fans everywhere for the support they have shown our team. The University of Tennessee has so much to offer – from great academic programs to incredible athletic resources to the most passionate fans in the country. I look forward to being the men’s basketball coach at Tennessee for many more years. In five years, Coach Pearl has been able to accomplish so much for the Basket-Vols, including their first No. 1 ranking, an overall SEC Championship, and four straight NCAA tournament appearances to go with an average of twenty-five wins per season. More than that, though, is the fact that Bruce has revitalized Tennessee basketball, bringing the program out of obsurity and thrusting it into the national spotlight. He gave us something to cheer for when Fulmer had us in agony. He brought a spark to Tennessee atheletics, and for that, I am forever grateful. This extension should be viewed as a token of our gratitude for a job well done. Keep it up, Coach. Most of the Tennessee blogs have been spurring rumors this offseason regarding the UT football team and their jersey choices for this upcoming fall. Numerous pictures have popped up, and one blog even had a create-your-own uniform contest. There’s no problem with this, as most true Tennessee fans have their hearts skip a beat at the mention of black jerseys, or even new jerseys in general. For example, in my four years of undergrad at UT, I would wager to say that I heard we were bringing out black jerseys for a certain game probably ten to fifteen times. But sadly, that day never came. And unfortunately, Mike Hamilton, Tennessee’s athletic director, seems to have squashed the black jersey rumor today, meaning that day might never come. Hamilton said he doesn’t expect black Tennessee jerseys “any time in the near or distant future.” He goes on to back up this claim by stating that all major uniform changes have to go through him, and that uniforms are ordered at least a year in advance. This means no new black jerseys courtesy of Kiffin & Co, at least not in 2009. 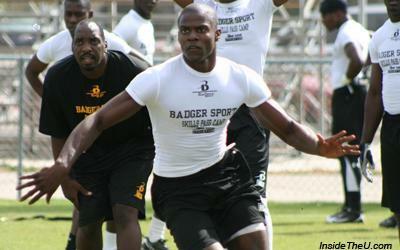 LaMarcus Joyner - One of the Nation's Top Prospects. First Jeff Luc, and now LaMarcus Joyner. The five star linebacker was the first to pencil in his visit to Knoxville for the first weekend in October, when the Volunteers play host to the Auburn Tigers. Well, Luc is now being joined by fellow five star LaMarcus Joyner, who has decided to make a visit that weekend too, according to Brent Hubbs over at Volquest.com. Joyner is the most sought after defensive back in the country, as he’s yet to commit his services to anyone, although Ohio State and Florida State seem to lead the pack of schools coveting the talented athlete. With over twenty offers from some of the top programs in the country, Joyner has plenty to think about before making his decision on where to play college ball. Something that might help the Vols in their quest to sign Joyner is the fact that he’s teammates with Tennessee’s newest commitment, No. 1 kicking prospect Michael Palardy. No doubt, Eddie Gran and the rest of the coaching staff, along with Palardy, will be doing all they can to make sure this five star defensive back ends up a Volunteer. Will Scroggins be our savior? Over the last month, the eyes of the Tennessee faithful (and obsessed) have focused upon the last remaining hope of Tennessee signing a big time QB prospect, Jesse Scroggins. After the Vols lost out on Blake Bell and Jake Heaps, the coaches’ focus shifted immediately to Scroggins, who fits the mold of a pro-style quarterback at 6’3 / 195 lbs. 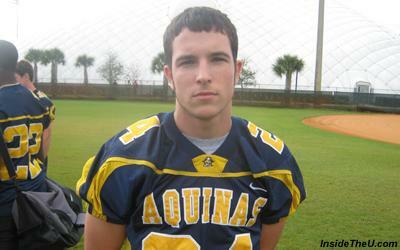 He’s a four-star prospect according to Rivals, and the No. 6 rated pro-style QB. If this isn’t enough to wet your whistle, Scroggins has indicated the Vols sit in his top three schools, along with the USC Trojans and Florida Gators. The elite QB has yet to tip his hand as to which school he’ll choose, saying that each of the three has its strong and weak points and he has no clear cut leader as of this week. A leader will emerge soon, however, as Scroggins says he’s focused now on weighing the pros and cons of each school, hoping that will help him make his decision by the end of the Elite 11 Camp, which takes place July 21-24. It’s a tough call as to where Scroggins will land, as he seems to have no clear leader with only two weeks left until he announces his decision. As Tennessee fans cross their fingers, rub their rabbits’ feet, and pray their hearts out, all we can do is wait, and hope, that our savior will come. With the start of the second session of summer term comes the realization that I am officially done with college. My departure, however great in my eyes, is only infantesimal when compared with the fact that four (yes, FOUR) incoming freshman are starting their careers as Tennessee Volunteers. Eric Gordon, Jerod Askew, Mike Edwards, and Zach Rogers all begin classes today, getting a late start to the Volunteer experience, but hey, at least they’re here. Each has a lot to catch up on, but most fans, and the coaches, expect a lot out of these young men, especially Gordon, who was a highly touted four-star cornerback recruit out of Alabama. On top of these four signees, Tennessee is welcoming quite a few walk-ons today, including Chase Phillips, a local stand-out from South-Doyle High School. Phillips brings some much needed depth to the offensive line, although he likely needs quite a bit of grooming to get to the competitive level the SEC demands. The newcomers won’t have long to adjust, as off-season workouts resume this Wednesday following the Fourth of July holiday weekend. New strength coach Aaron Ausmus will likely have the young guns hitting the weights hard, making up for lost time and to make sure they’re ready when fall practice begins August 4. In case any of you forgot, Tennessee football kicks off in a little over sixty days. Well, it didn’t take long for some breaking news to hit the Vol-waves after my recent resurrection. There’s no doubt that this huge signing can be attributed to none other than the machine that has taken over Eddie Gran’s body. Gran has been all over the state of Florida these past few months, and his work is starting to pay dividends, as Palardy becomes the third commitment that can be credited to Gran. The other to include two other Miami prospects: Jose Jose (OL), and Ralph Williams (LB).